Chateau Siaurac is a stunning estate in Lalande de Pomerol dating back to 1850. Today the estate is owned by the Artemis group (owners of Chateau Latour amoung other prestigious global wine estates). 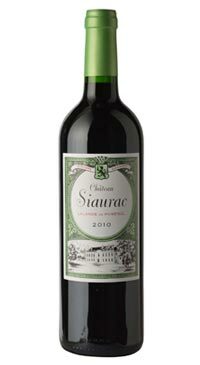 Chateau Siaurac boasts almost 37 hectares of vineyards planted to 75% Merlot, 20% Cabernet Franc and 5% Malbec. The terroir is gravel and clay. The vineyards have been managed sustainably since the 2008 vintage and as of the 2016 have converted to full organic and biodynamic farming techniques. Vinification takes place in concrete and stainless steel. The wine is aged in 15% new French oak barrels for about 12 months. Siraurac begins to open up and really shine five to ten years after the vintage. This is a rich and plummy red.